Dubai, UAE, September 05, 2018: The irresistible blend of sensual glamour and grunge attitude of 1990s fashion relives in GUESS’ American Dream capsule collection. The brand’s iconic adverts feature on bold prints in bright colours. Clashing primary hues, such as red, yellow, blue and violet, accentuate the face of pin-up models in true Warhol style, for a modern take on a pop classic. Playfully provocative prints stand out on signature t-shirts. 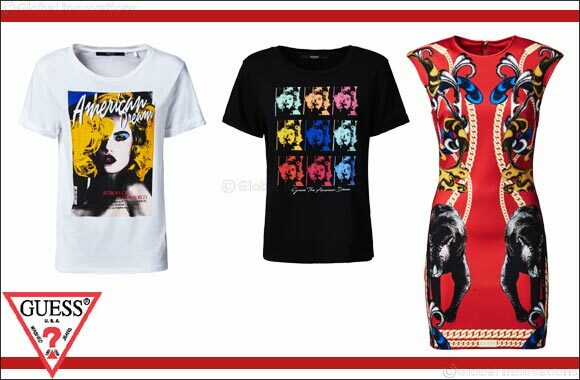 Colours on a background of black stand out on sweatshirts and tees, highlighting catchy slogans that celebrate beauty, passion, desire… all keywords of the world of GUESS! In denim, super stretch fabrics and a twill weave characterise women’s styles in vintage washes, with an abraded front providing an added injection of grunge. Slim and skinny fits enhance the body’s curves, making for hot looks when paired with a trucker denim jackets. The GUESS American Dream Capsule Collection is available in stores now.